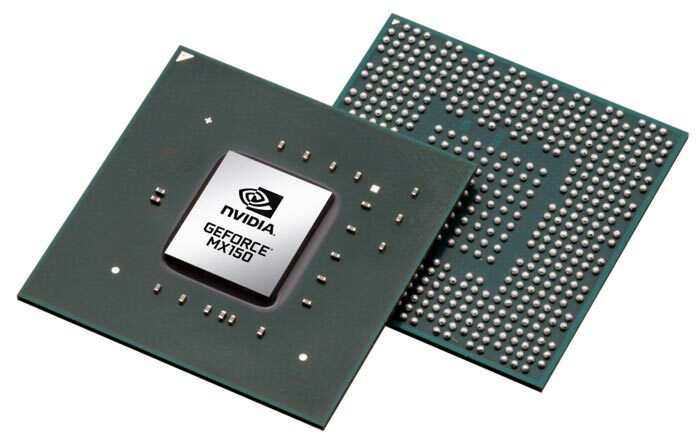 Nvidia has announced the GeForce MX150 GPU for laptops. In a nutshell this is the Pascal-based successor to the popular GeForce 940MX, which was seen in many a laptop designed to deliver GPU acceleration without going for full throttle gaming. 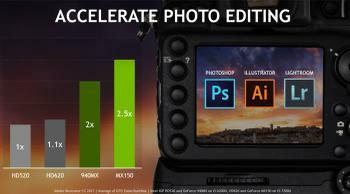 Nvidia admits as much in its blog blurb, saying that it is targeted at those who indulge in "photo and video editing, as well as a spot of gaming at the end of the day". So what does the GeForce MX150 bring to the table? 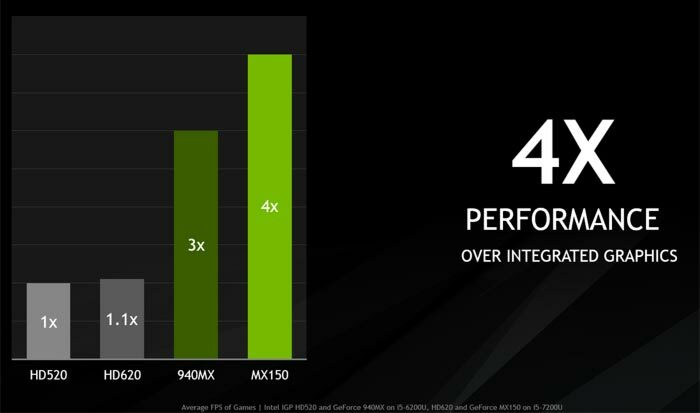 Nvidia largely compares it to the aforementioned predecessor, the 940MX, and to common integrated graphics solutions from recent Intel architectures. 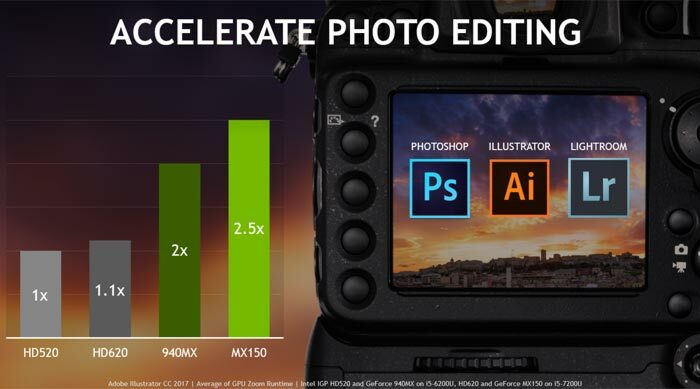 First of all, considering performance, the new GeForce MX150 is said to be 20 per cent faster than the 940MX in advanced photo editing, 33 per cent faster in video processing, and 33 per cent faster in gaming. 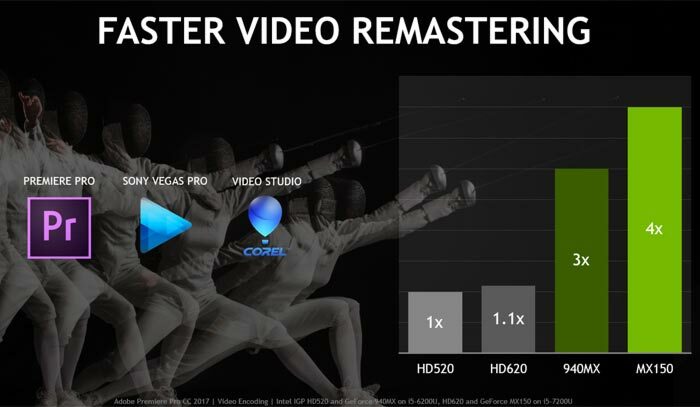 That's 4x faster than the Intel HD520 or HD 620 in gaming. In example games tested by Nvidia (Dota 2, Counter-Strike: Global Offensive, League of Legends, or World of Tanks) the MX150 is said to be capable of delivering "full HD resolution at a smooth 60 frames per second". For mobile solutions power efficiency is also key and the new Pascal-based part helps deliver significant advantages judged by this important metric. In Nvidia's own tests the MX150 offers 3x the performance per watt compared to the 940MX. As usual, Nvidia helps conserve your laptop battery life using its Optimus and GPU Boost technologies. New laptops featuring the GeForce MX150 GPU, from the likes of Acer, Asus, Clevo, HP, and MSI, will begin shipping globally in June. We are likely to see quite a few of these at Computex, just a few days away. Tech specifications of the GeForce MX150 are currently only sketched out vaguely on the official Nvidia product pages. 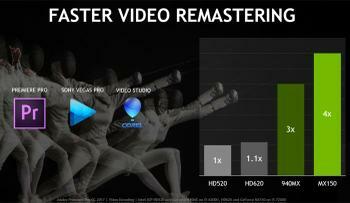 Hopefully that will change with the first hardware releases. An increase from 3 to 4 is not 25%, but 33%. It would be correct to say that the 940MX is 25% slower, but that's something else entirely. Yes, looks like I calculated that upside down. Will correct shortly. Interesting to see how they for some reason entirely divest this chip from the mainstream Geforce series. I wonder if it's based on GP108, cut down in some way, or if it's an even smaller chip (which sounds unlikely, although the 940MX seems to have impressive adoption rates, which might make that viable). Also, does this mean that there won't be a mobile GT 1030?